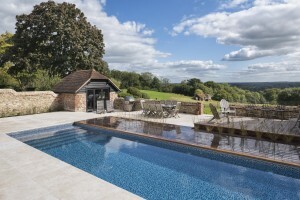 Surrey-based Falcon Pools was named overall winner in the Residential Outdoor Pool of the Year category at this year’s UK Pool & Spa Awards, with this outstanding concrete tiled pool. Falcon Pools’ brief was to create a natural looking swimming pool that would blend well within the traditional surroundings of the property. A safety cover was also stipulated by the client. The construction method employed was a waterproof concrete shell, which was tanked using high end materials. The pool water is heated by a Calorex Pro-Pac heat pump, and is treated with a UV system, supported by an auto chlorine tablet feeder. The pool features a Coverstar automatic safety cover and LED lights and is finished with Aegean Naxos 23mm ceramic mosaic tiles from Designworks. Falcon Pools designed all of the stainless steel fittings. “We exceeded the client’s expectations by recommending a decked area and pool size was exactly what the client wanted,” explains Lee Woodhams of Falcon Pools.